Tomorrow night (Friday), Alan Reynolds will be able to watch his Waterford side play again after a month recovering from a horrific assault. And the 44-year-old Blues boss has admitted that he is lucky to be around after being the victim of an attack that left him with a broken leg and serious facial injuries. The incident in Tramore is the subject of an ongoing criminal case. A man was arrested in the hours after Reynolds was struck down and left with serious injuries which required urgent treatment in hospital. Reynolds has been absent from the Waterford sideline for their past two matches and only returned to the training ground this week to say hello. He plans on attending tomorrow night's league match away to Bray Wanderers, but will not be able to sit in the dugout as he continues his recuperation from his injuries. Reynolds gave his first full interview on the episode in the new LOI Weekly podcast and detailed the injuries that left him in a bad way. "Where do I start? I had a broken leg, which needed to be operated on," he said. "I had a pin and screws and plate put in. "I had a broken nose, a fractured cheekbone, a few stitches on my face - I was black and blue - and that's roughly it. Besides that, it's perfect. "It was really difficult. I know I'm laughing and joking, but it was a tough time for us all, for my family and that. "This was something I wanted to keep low-key, but it was the talk of the city down here and then it went national. It was a shock and everyone was upset about it. These things are happening frequently (in Ireland) now. "I'm lucky to be still here and looking forward to getting started again. I popped in this week to see the lads and I'm hoping to be in Bray." Reynolds is due to return to hospital this morning for another check-up and he has been fitted for a protective boot. He is unable to discuss the specific details of the assault at this juncture. "I can't say too much," he said, "There is a case going on. More will develop and all that takes time. First and foremost, I have to get back to full health. "The messages I got from other managers and coaches were fantastic. The likes of Brian Kerr and Pat Dolan, great supporters of the league. A lot of the managers from both divisions have been in touch, which is pleasing. "At the end of the day nobody wants to see this happen and we understand the pressures we're under in our jobs so it's great to get that support from them." "I want to get back and help the cause. The lads who have been there have done very well." 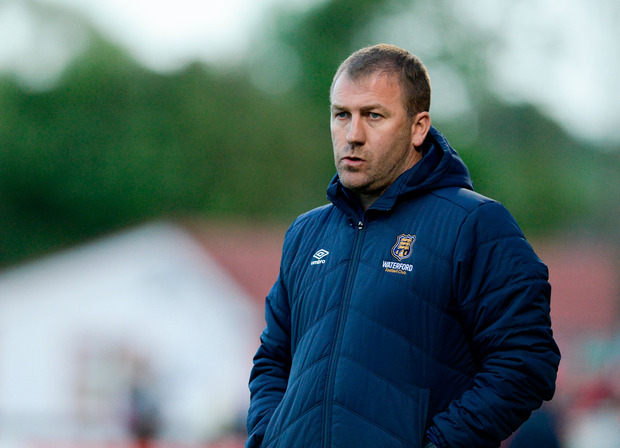 The coaching staff were helped by the arrival of Noel Hunt with the former Irish international signing up in a dual role as player and assistant to Reynolds. He is available to play from July, but Waterford will be saying goodbye to midfielder Faysel Kasmi who has gone back to Belgium to sign for second-tier side Beerschot Wilrijk.